Let’s face it, you just can’t beat a good old ragu! Comforting, rich and warming, it really is the perfect choice for a hearty meal so get cooking. To balance the richness of the ragu I made a gremolata to serve with it to add an extra freshness. Gremolata can be served with a range of meat and fish dishes and is so quick and easy to make so do give it a try. 1. Get cracking by preheating the oven to 160c/ 140 fan. Take a large casserole pan and heat a good glug of oil over a medium to high heat. Add the chunks of boar and cook to brown them off. You could do this in a couple of batches if needed so you don’t overcrowd the pan and start to boil the meat. When browned, remove the boat and set aside. 2. Next up keep the meat juices in the pan and cook the garlic, onion and pancetta until the onion is softened and the pancetta is turning golden. Pop in the carrot and celery and cook for a further couple of minutes. Stir through the tomato puree and make sure it is all well combined. 3. Add the red wine and reduce by half before the stock and tomatoes go in. So in the herbs and season. Cook in the oven for 3 hours until the boar is tender and simply falls apart. Whilst the ragu is coming you can also make the gremolata if you’re using this by mixing all the ingredients together and cooking in the fridge until you need it. 4. When you’re ready to serve, start off the polenta. Cook it according to packet instructions as it can vary slightly. At the end of cooking take the pan off the heat and stir through the butter and parmesan. Taste and check the seasoning and tweak according to taste. 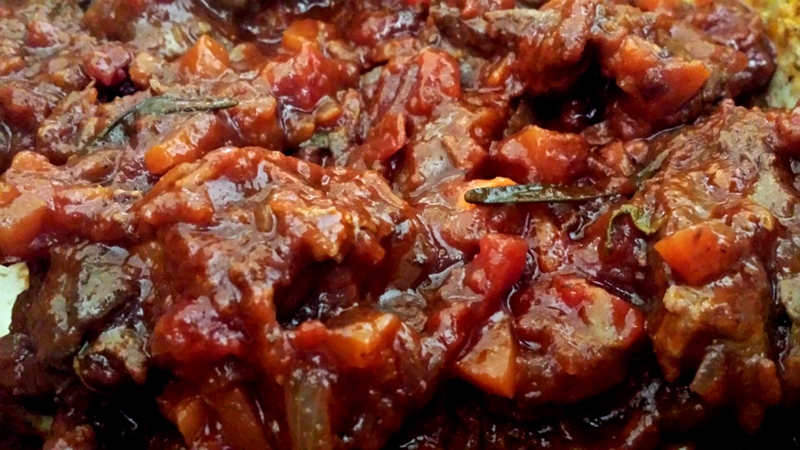 Serve the unctuous ragu on a bed of polent and a small amount of the gremolata on top. Wild boar ragu with parmesan polenta and a gremolata topping- rich, fresh and oh so satisfying! This entry was posted in Recipes and tagged Italian, parmesan, polenta, ragu, red wine, wild boar by sotiris14. Bookmark the permalink.